If that's correct than it's 30 09 1710 : PlaymoDB Part Info for "Rock Formation, Large, 3 Holes, 3 Clips"
Does anyone have an extra of this or know where I can get it? I haven't called DS yet as I'm out of minutes until next week, so I would also like to know if any of you think DS might have it. £2.15 from UK DS, plus £300 shipping to US (probably less), unless I have one, in which case you could save £2.15! But someone nearer to you may well have one! Thanks, Graham! When I can confirm that this is the missing piece, I'll let you know. The set is supposed to arrive today, but no sign of it yet. I'm currently on a dragon kick & am picking up a lot of the little beasties. 5984 arrived today, a week late & in a damaged box, but that's OK. It is missing more than 1 piece. Yes, base piece 30 09 1710 is missing. Also missing are: Rock 30 02 4240; Fire (x2) 30 05 0040; Cuffs (x2) 30 29 4770; Belt Clip 30 20 3202. 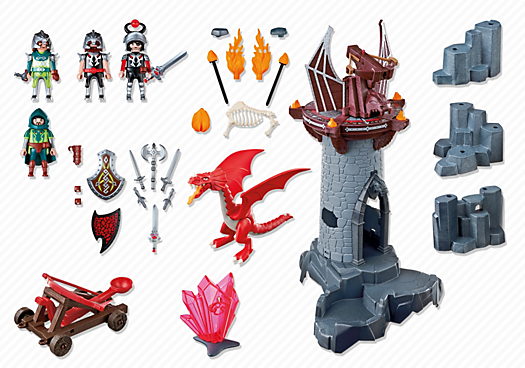 There were 2 extra pieces which aren't even Playmobil, plus an extra jewelled sword. One piece, part of the tower, is broken, which may have happened when the box was damaged, but it can be fixed easily. Overall I'm happy & satisfied because it was only $17 & adds to my dragon collection. Now to track down what's missing. Graham, I'll be dropping you a message. Better try "surface air lifted".